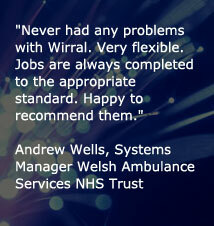 Wirral Installations are providers of specialist installation systems. We can provide complete communication installation systems and have been doing so for over 15 years. We supply to a variety of business sectors for all types fo budget. The cabling systems we install come with full Warranty ranging from 15 to 25 years.